When I put Nolan’s sweatshirt on him yesterday morning, he thought it meant we were going to be going for a walk in the stroller. Imagine his disappointment when we went to the dentist’s office instead! All day he kept hopefully luring me over to the front door, saying “Wa” for emphasis. Since it looked like the weather would hold, I finally gave in at 5:30 and we headed out for a short walk before starting dinner. As we left the house, I caught Nolan yawning and thought that he might not stay awake all the way over to the park, so we headed in the direction of the community garden instead; I had received an email indicating that there might be ripe cherry tomatoes that needed picking before the threat of rain on Thursday. 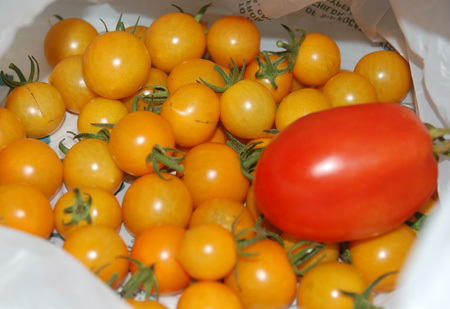 At the garden, I was fortunate enough to meet the man who had planted the tomatoes, a member of the garden board. He encouraged me to harvest some—they are called sun-sugars—and we chatted about the garden and cooking for a bit, just long enough, as it turned out, for Nolan to fall asleep in the stroller. So it wasn’t much of a walk for him—I guess that means we should try it again this afternoon! After picking some tomatoes, we went back home and the munchkin ended up sleeping straight through the rest of the evening. That gave me a rare opportunity to make dinner without interruption. We had more wild salmon to eat up, and to be perfectly honest, I am just a little tired of it at the moment, although it is so good for us and won’t be in season much longer. I’ve been kind of scrounging around trying to find interesting new ways to cook it that doesn’t cover up its natural flavor too much, and last night’s recipe involved a short marination in a mixture of pomegranate molasses, honey, garlic and white wine for a Mediterranean-inspired flavor. The side dish was a little more difficult, since I still have a wide array of produce options all clamoring to be eaten before they wither, but I somehow found the absolute perfect recipe to suit our needs: a Turkish bulgur pilaf calling for pomegranate molasses, black-eyed peas, and fresh tomatoes. I cooked some of my dear purple hull peas right in the pot with the bulgur, after sautéing onion with some chopped radish greens and then searing a handful of the cherry tomatoes until they softened slightly. The beauty of a pilaf, of course, is that it is utterly adaptable to whatever flavors you want to emphasize or vegetables you want to use up. As for its dressing, I just used a bit of the boiled-down pomegranate marinade whisked into olive oil. The finished plate was drizzled with a bit more reduction, which lent a pleasantly tangy flavor that Jeremy guessed was balsamic-based. Overall, a tasty and very different use for salmon, and I suspect the pilaf could hold its own as a vegetarian main course as well. 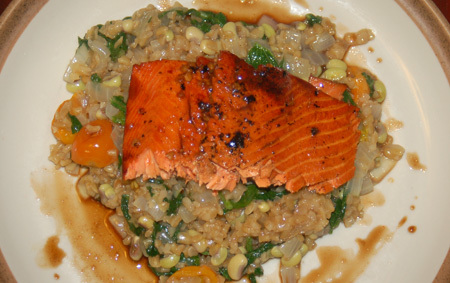 For the salmon: Stir together the marinade ingredients from pomegranate molasses to wine, until dissolved. Pour into a Ziploc bag and add the salmon; seal it, removing as much air as possible, and store in the refrigerator for 1-2 hours, turning halfway through to promote good coverage. When ready to cook the salmon, heat a non-stick skillet over medium high heat; remove the salmon from the marinade, wiping off any bits of garlic from the fish, and reserve the marinade. Add a splash of olive oil and toss in the cherry tomatoes; they will pop and sizzle, so be careful, and remove them to the pilaf as soon as they brown and soften slightly. Wipe down the skillet if there are any charred tomato bits, then add the salmon, skin-side down, and cook over medium heat for several minutes, until the skin is crispy; turn and cook to your desired level of doneness. We prefer our salmon cooked through and we aren’t fish-skin fans, so I let my pieces go a little longer on the skin-side, until it was nearly charred (that makes it really easy to remove) and proportionally less time on the flip side; the skin helps protect the fish from drying out. Meanwhile, strain the garlic out of the marinade and boil it to reduce by half in a small saucepan. Whisk about 2 tablespoons of this with equal parts olive oil and toss through the pilaf; drizzle some of the remaining sauce around the plate and over the salmon before serving. Sources: Adapted from Mediterranean Cooking in Alaska and Epicurious. I love your blog – you never disappoint and always inspire. These photographs of yours are amazing. I am making this recipe TODAY. Thank you, thank you, thank you.